Sometime in early September, a few hundred people around the world received in the mail a flat, cardboard box containing a heavily padded, highly anticipated vinyl record. Ostensibly, those same few hundred people slipped the record out of its astral-themed jacket and then placed it under the needle of their record player. Assuming they started with side A, they would have listened to the opening track, “Control,” an upbeat dance-pop tune by the Sydney band Olympic Ayres. Had they started with the other side, they would have heard a moodier, piano-laced ballad called “Baptize” from a Los Angeles band named RKCB. Because therein lies the beauty of this vinyl release: It’s a mixtape, not an album. Called Vinyl Moon, the nascent, Los Angeles–based endeavor is a subscription-based vinyl mixtape series, featuring a new 10-track release mailed out every month. Each curated release consists of songs from relatively obscure and unknown indie artists and bands. In addition to the records, each volume comes with stickers and postcards, and each record jacket is decorated with original, custom artwork from different artists. Not only did Bogajewicz have experience working with both bands and labels but he also had what he called “a pretty good trust certificate” through his music website, the Burning Ear, which would give him another outlet for promoting the bands (who, so far, don’t get any licensing royalties for letting Vinyl Moon use their songs). Plus, this was not Bogajewicz’s first time making mixtapes. As a student at Venice High School, he compiled, recorded and decorated his first mixtape in 1997: a punk- and ska-heavy cassette tape called Zev, the Cry of the Wolf, which was “all about the bands you know but the songs you don’t.” Zev was followed by Come On Everyone: 29 Ska-Licious Tracks in 1998 and The Watermelon Collection the year after. 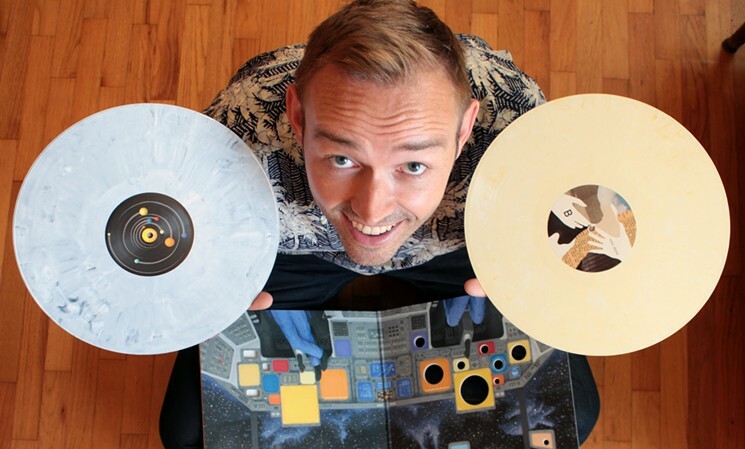 In May of this year, Bogajewicz created a Kickstarter campaign to fund Vinyl Moon. In the span of a month, the project earned $8,500 more than the $10,000 goal, and volumes 1, 2 and 3 sold out. With each monthly release, the number of subscribers has grown; about 700 people will be receiving volume 3 in the mail in November. Though each volume has a different theme or mood (volume 3 is more mellow; volume 4, says Bogajewicz, will be half dance-pop, half rock and guitar), pretty much every song, band or artist can be prefaced with the word “indie.” In fact, according to Vinyl Moon’s Kickstarter page, the only genres you’re not going to hear on a Vinyl Moon release are metal or country. Bogajewicz believes there are a lot of different factors that will draw people to subscribe to Vinyl Moon. There will be those who like discovering new music from fledgling bands, as well as those who simply like the idea of getting something in the mail each month. Others might have a penchant for mixtapes or limited-edition vinyl, or an abhorrence for using the Internet to find and play music. Regardless, the one thing uniting all of Vinyl Moon’s subscribers is probably their love and appreciation for analog music.